BACKGROUND: Dalmatian toadflax is native to the Mediterranean region. It is likely an escaped ornamental plant that is an invader of dry timber and rangelands. 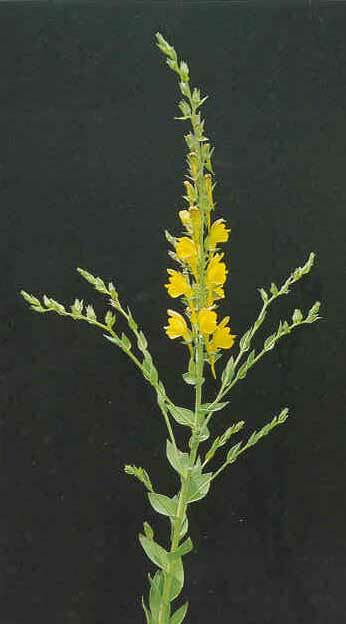 Dalmatian toadflax spreads both by seeds and roots. DESCRIPTION: Dalmatian toadflax is a perennial that grows up to 4 feet tall. Waxy green leaves are heart shaped, 1 to 3 inches long, and clasp the stem. Flowers are 1 inch long (excluding the 1/2-inch spur), yellow, often tinged with orange or red, and similar in shape to snapdragon. Plants flower from midsummer to fall. Seeds are produced in a 1/2-inch pod and are irregularly wing angled. DISTRIBUTION: Dalmatian toadflax is primarily a weed of the intermountain West, including most counties in Idaho, but a population also exists in the Great Lakes region. CONTROL: A biological control agent (defoliating moth) is available, and its effectiveness has been very good in Idaho. This weed can be controlled with herbicides.